Turkish Politics in Action: Standing in the Way of Economic Growth? Tekel workers won an important victory at the Council of State at the end of last month when the Administrative Division of the Council of State's General Commission ruled that the government's relegation of their employment status to 4-C temporary worker status exceeded its powers and violated the rights of the former tobacco-industry workers. The Council applied to the Constitutional Court to annul the legal validity of the status. 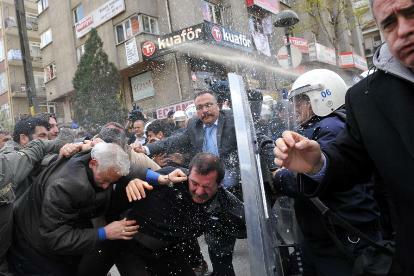 A few days later, Tekel workers again took to the streets to stage a one-day demonstration in Ankara on April 1. However, police would not allow them to re-occupy their previous position in front of the Confederation of Turkish Labor Unions, or Türk-İş, headquarters in Ankara’s Kızılay district and clashes followed as demonstrators were pushed into other sectors of the city. Prime Minister Erdogan had strong words for the protestors: "Who are they? They are overshadowing the current positive developments in the country. The growth rate in the last quarter is 6 percent. We should focus on this. We can’t allow illegal actions." For more on the Tekel stand off, see March 7 and Feb. 9 posts.